Looking for a great way to celebrate Dr. Seuss’ birthday and reading month? 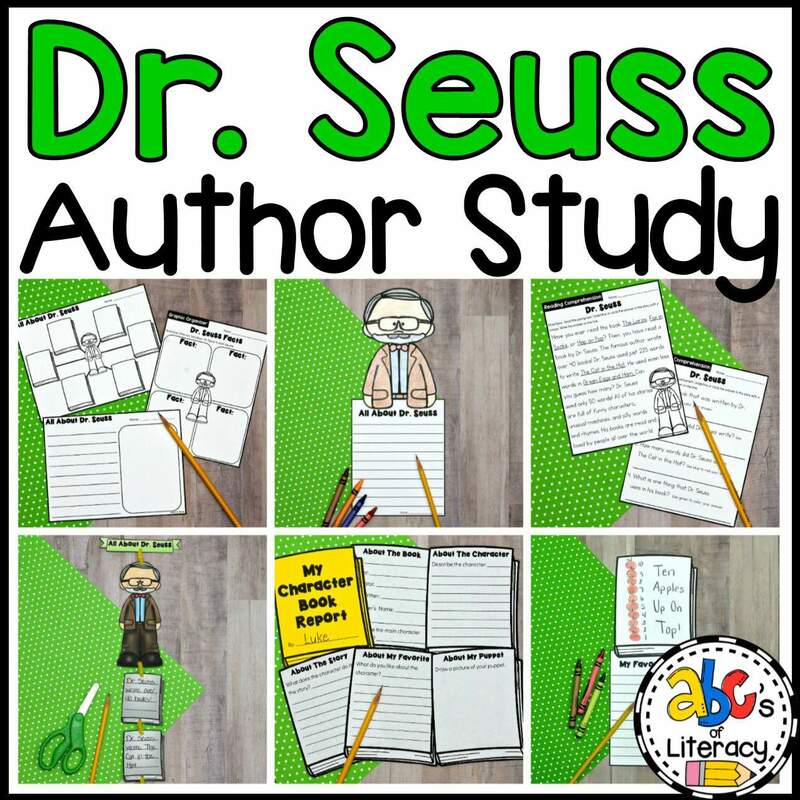 Then, you’ll love our Dr. Seuss Author Study! As a part of our author study, your students will create a puppet inspired by a character in a book by Dr. Seuss. 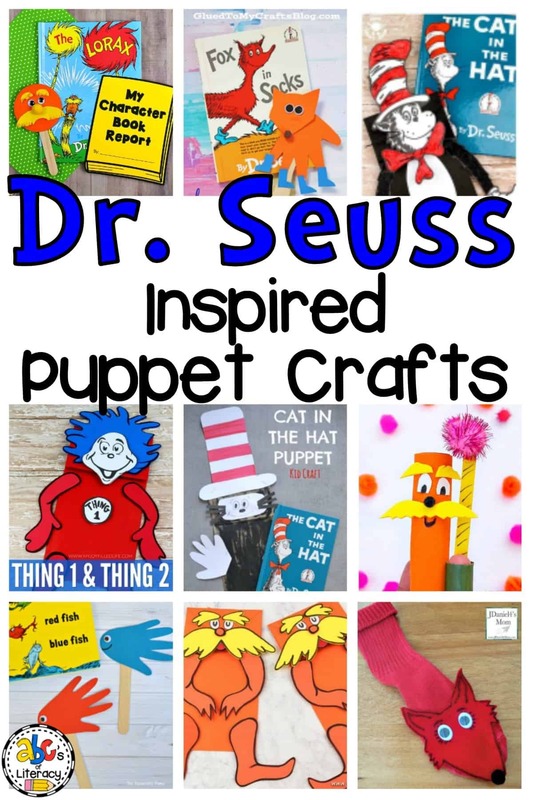 If you are looking for some creative ideas, your students are sure to love all these amazing Dr. Seuss Inspired Puppet Crafts that bring author’s books to life! When it comes to reading fun and engaging children’s books, Dr. Seuss is more than likely at the top of your list. Not only are there a ton of amazing Dr. Seuss books to choose from, but each one is different and unique in its own way. From the rhyming to the illustrations, it’s no surprise that children all over the world keep coming back for more and more reading time with these books. Dr. Seuss’ birthday on March 2nd is the perfect time of the year to celebrate and learn all about the beloved author. Who doesn’t love The Lorax? All the bright colors and characters make this book by Dr. Seuss truly one of a kind! With The Lorax Inspired Puppet Craft, your students can read and act out the store as many times as you want! Aren’t things always better in pairs? With these simple and fun Thing 1 and Thing 2 Puppets, let the imagination of your students run wild and act out whatever words and pages from the books by Dr. Seuss that they choose. What is better then handprint crafts? This Handprint Fox in Socks Kid Craft Puppet is not only adorable but an easy and fun character craft to create. No matter your age, there’s always going to be a soft spot in your heart for the Cat in the Hat, right? Have fun creating this adorable character with this Dr. Seuss Cat in the Hat Puppet. Shadow puppets are so much fun and these Dr. Seuss Shadow Puppets are no exception! Grab a few Dr. Seuss books and read them by flashlight, using these shadow puppets as fun props. Don’t throw out those paper bags! You can totally reuse them and create these adorable Paper Bag Cat in the Hat Puppets! Don’t throw out your old socks either! Isn’t this Fox in Socks Sock Puppet absolutely adorable?! Your students are sure to love making and wearing this one. Who says that puppets have to be huge to make an impact? The Lorax & Truffula Tree Finger Puppets are certain to bring hours of fun to you and your growing reader! One of the most famous Dr. Seuss books has to be One Fish, Two Fish, Red Fish, Blue Fish. Everyone knows and loves that book! Bring those cute little fish to life with these adorable Red Fish Blue Fish Handprint Puppets! The great part about making Dr. Seuss Inspired Puppet Crafts is that the crafting options are truly endless! Your students can use these ideas for inspiration or easily think up their own as well. 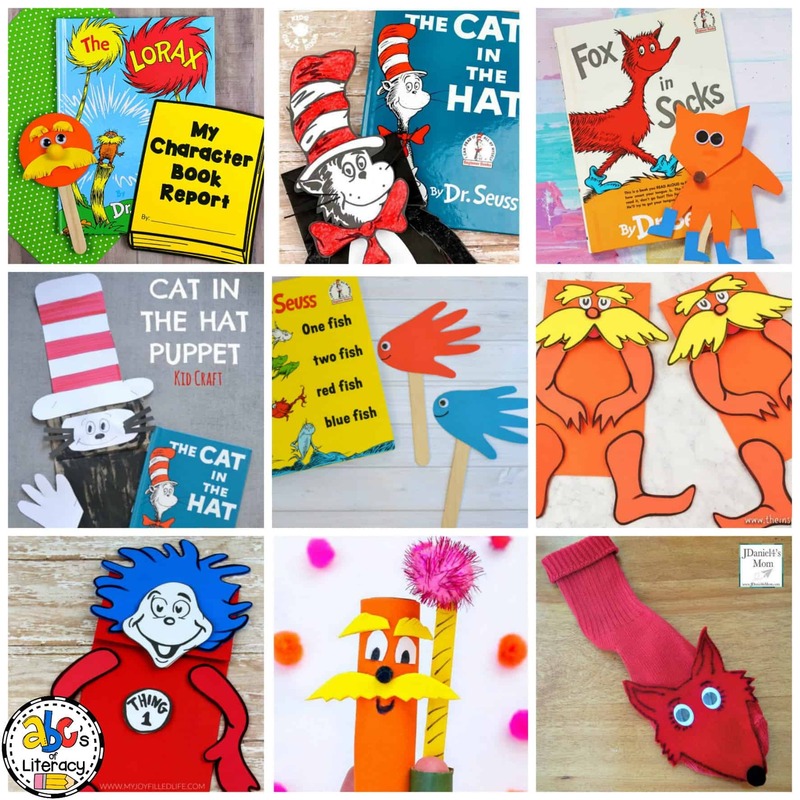 Either way, these book-inspired crafts are going to be a great addition to your Dr. Seuss Author Study!